September 25 is a holiday for all of you seafood lovers out there. It is the National Crab Meat Newburg Day. In the late 19th century, Ben Wenberg, a sea captain, invented a seafood dish made from lobster, cream, butter, eggs, cognac, sherry, and Cayenne pepper. He demonstrated it at Delmonico’s Restaurant in New York City. The dish was added to the menu as Lobster à la Wenberg. Due to an argument between Wenberg and the restaurant's owner, the dish was later removed from the menu. 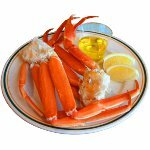 However, the restaurant continued to serve it under a different name, Lobster Newberg (Newberg is an anagram for Wenberg). It is sometimes spelled Newburg. Crab meat newburg (or simply crab newburg) is similar to the original dish, the only difference being that crab meat substitutes for lobster. You can easily cook this reach, creamy dish yourself. In a skillet, melt 1/3 cup butter over medium heat. Add 1 pound fresh crab meat, stir and cook for 2 minutes. Mix in 1 pint sour cream, 2 tbs tomato paste, 2 tbs grated Parmesan cheese, 2 tbs dry sherry, and 1/4 tsp freshly ground black pepper. Cook until heated through, stirring constantly. Be sure not to boil! If you do not feel like cooking, you can celebrate the National Crab Meat Newburg Day by going out to your favorite seafood restaurant.